Last week I peeled walnuts. I sat down with a sharpened skewer and a bowl of walnuts, doused in boiling water. I slowly, methodically, lifeted the sheer skins off the nut, scraping each surface, excavating each tiny canyon. Most of my days are measured by time. I wake (too early) to the alarm, then it’s rush all day long to meet one deadline after another – beat the traffic, get to school by the first bell, get to work on time, get to daycare before it closed, get the children fed and bathed and in bed by a reasonable hour, and then squeeze in whatever leisure I can before I must go to bed, too, in order to have the energy to tackle the next day. Meals, too, are hurried affairs. What breakfast can be eaten in the car? Do I have time to pack lunch or is it cafeteria day again? How quickly can I get dinner on the table? Do the grownups get to eat before 9 pm? What I’m primarily looking for in a recipe is some combination of efficiency, taste and health – I don’t have time for precision or technique. But occasionally, I will be able to steal an hour to sit down and peel walnuts. I was making chiles en nogada – a Pueblan dish of stuffed chiles topped with a creamy walnut sauce and pomegranates. We had guests visiting from out of town, and I wanted to make something special. 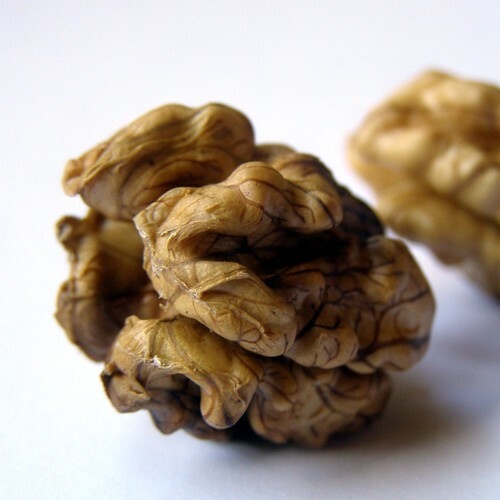 The recipes I found warned that the walnut peels added a bitterness to the sauce, and so I sat down, ignoring the piles of laundry, the dishes in the sink, the emails to be answered, and I lifted the skins off those walnuts with a pointed skewer, bit by bit, seeking, as I did so, the touch of the sublime. There is joy in this kind of work, if you can find it. If you can leave behind the deadlines for some time and work with your hands at a tedious task that will take your finished product one step closer to perfection. If you can inhabit your task, thinking only of what is in front of you – not today’s crises, or tomorrow’s challenges, but only this – the walnuts, the skewer, the bowl of creamy nuts, stripped of their protective skin. This is why I love to cook, and the type of cooking I love to do – to take the time to make something, to take the extra time to make it well, to make it right. Not every meal is like this. Heck, not one in ten meals is like this. But if it weren’t for these meals – these meals prepared without the pressures of the world – I couldn’t make the others – the dinners on the table in ten, the breakfasts on the go, the brown bag lunches. There have been a slew of articles lately about people who hate cooking – the drudgery of it. I get it! I do! Getting meals on the table can be a real slog. I value shortcuts – and I share them with you here – because I need shortcuts. I need the tips and the tricks to keep the domestic front from losing us the war. And that’s why a lot of the recipes I post here on The Domestic Front are just that – recipes that help you get meals on the table, even when it’s a chore (and by you I mean men and women. I’m not trying to tie women to the kitchen. But we need to eat, and our kids (if we have them) need to eat, and there is value in eating good, home-cooked food, in a culture of cooking, and of developing skills and self-reliance. But if the only cooking you ever get to do is the kind you have to do, it will always feel like a slog. It will be hard and hateful. But if just sometimes you can take the time, have the luxury to cook something because you want to, not because you need to, take the time to make it just a little better without bringing down the whole operation, find your groove in a quiet kitchen – that’s where the good stuff is. I didn’t peel all the walnuts. I decided, after an hour or so, with my fingers pruned and my shoulders hunched, that I would prefer bitterness in the sauce to bitterness in my soul if I continued. It was delicious anyway. The point is in the process.